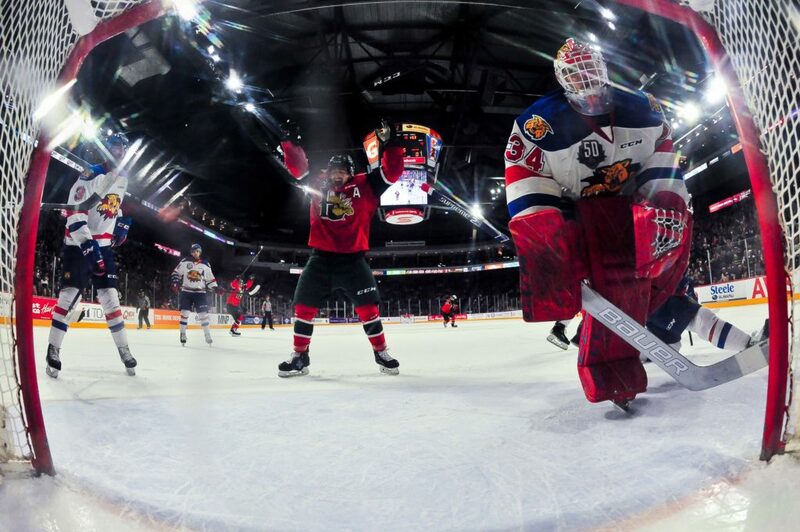 Round 2 of the President Cup Playoffs is off to a nice start for the Halifax Mooseheads who skated to a 5-3 victory on home ice over the Moncton Wildcats on Friday night to take a 1-0 series lead. Raphael Lavoie had two goals and one assist, Samuel Asselin had one goal and two assists and Antoine Morand had a trio of helpers as the top line combined for nine points in front of 7,619 at Scotiabank Centre. 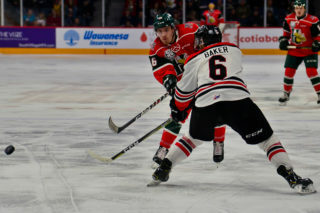 The Mooseheads had a lot of time and space against a Wildcats team that showed signs of being tired from a hard-fought seven game series against Baie-Comeau. Halifax peppered Cats goalie Francis Leclerc who made 49 saves on the night including 25 in the first period alone. The Mooseheads were extremely disciplined and did not take a penalty in the game. The Herd also went 1-2 on the power play and out-shot their opponents 54-23. 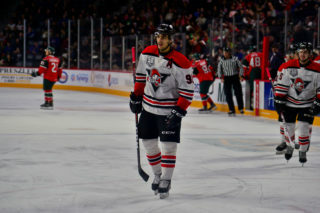 Despite the stark contrast in shots, the game wasn’t totally in control until Lavoie scored on an empty net for his QMJHL playoff leading ninth goal and 16th point. 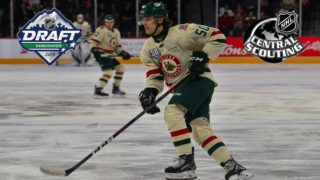 The goal came with just five seconds remaining in regulation, but Moncton had been pressing with Leclerc on the bench and six attackers on the ice. 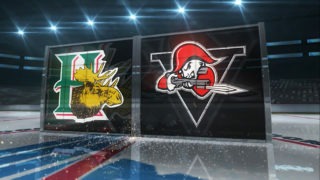 The Mooseheads were first on the board in the game when Lavoie scored the first of his two goals late in the first period just seven seconds into a Kyle Foreman penalty. The Chambly, QC forward slammed in a rebound off an Antoine Morand shot to crack Leclerc who had made more than 20 saves by that point. Moncton answered back in the second period on a nice shot by Alexander Khovanov at 5:19 to tie the game 1-1. Halifax was quick to silence the throng of Wildcats supporters in the upper bowl when Xavier Parent converted on a nice pass by Patty Kyte just over a minute after the Moncton goal to regain the lead 2-1. The Cats were able to pull even again 2-2 late in the period as Brady Pataki crashed the net and lifted in the rebound in front. 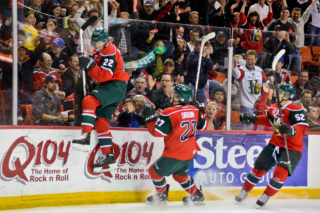 Just like earlier, the Mooseheads didn’t give Moncton much time to savor their goal as Samuel Asselin pounced on a puck in the crease on the very next shift and Halifax went in front 3-2 just 20 seconds after the Pataki tally. The score sat at 3-2 heading into the final period of regulation and stayed that way until a busy final five minutes of the game. Jared McIsaac came up with a huge one when he carried the puck in along the boards from the point and used a nice toe drag to get around defenceman Christian Huntley. The Red Wings prospect then beat Leclerc on the short side, blocker to give the Moose a 4-2 cushion. It turned out to be an extremely important goal and was the game-winner. Moncton got a lucky bounce off a crowd of players in front of Alex Gravel 32 seconds after McIsaac’s goal and it was a 4-3 game. Halifax didn’t allow much for chances after that and Lavoie finished things off with his emty netter set up by some great passing between Morand and Asselin and the team celebrated the Game 1 victory. The Wildcats had a makeshift blueline by the end of the night. Already missing star defenceman Jordan Spence due to injury and Aleksi Anttalainen who served the final game of a suspension, the Cats lost Jonathan Aspirot to an injury during the game after he was on the receiving end of a hit and never returned. He will be reassessed in the morning and is listed as day-to-day. Asselin was named the first star with his three point effort, Leclerc picked up a well deserved second star and McIsaac earned the third star. 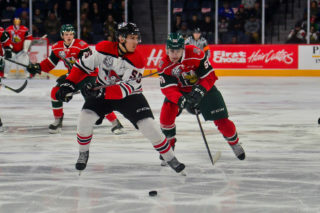 Game 2 will be played Saturday night at 7pm at Scotiabank Centre before the series shifts to Moncton for Games 3 and 4 on Tuesday and Wednesday of next week. Tickets for Saturday’s game are on sale now at the Ticket Atlantic Box Office, TicketAtlantic.com, select Superstore Outlets, the Official Mooseheads Shop in Scotia Square or by calling 902-451-1221.